You have no idea how I craved something like this! It must have been a full week of me pining for these flavors together, that led me to finally take a stab at it. 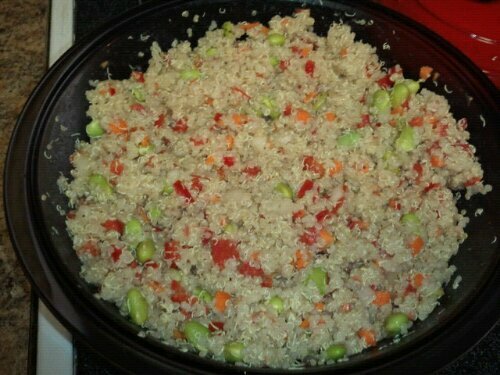 I knew I needed quinoa, edamame, red bell pepper and onion in a vinaigrette of some kind. I had a container of leftover chopped yellow onions that I had pickled in red wine vinegar that provided the real base for the flavor, but you can add the two separately. This is certainly a base recipe that you can adjust based on your preferences and what’s in your fridge. I really loved it with the kelp powder! 1. Bring the water up to a boil in a medium saucepan. Add quinoa and let it boil for about two minutes. Cover and drop to low to simmer for 15 minutes. Fluff with a fork. 2. Meanwhile, cook frozen edamame according to package directions. Usually, add to boiling water, wait for it to come back up to a boil and drain after 5 minutes. 3. At this point I combined the two and put it in the fridge to chill before adding the rest of the ingredients. You certainly don’t have to, and can just go ahead and add everything in, and then chill. Adjust seasonings if necessary and serve. Yum. YUM. This looks amazing!! I love edamame and quinoa for protein, and combining the two is genius. Also, gotta try pickled onions.